Looking back at my week at Camp Fort Worth, I’m really grateful and blessed to have been part of it, both as a “camper” experiencing it for the first time and as a chaperone/small group leader. New friends made, got to do things that I would not have normally done or have the opportunity to do, and to share being Catholic with others. I mentioned already that I took a week off from work, using vacation time. I knew a year ago that if I wanted to do Camp Fort Worth this summer, I would have to save my two weeks of earned vacation and devote one of those weeks for the opportunity to attend. And, boom. Earned vacation. Saved it. Attended Camp Fort Worth. …you see, all summer leading up to camp, I’ve been dealing with stuff. You know how sometimes you know yourself well enough that you can anticipate how you’d feel when certain things happen, and when they happen, you see that you’ve gone the way you expected? Yeah, that happened with me through a series of various events this summer. Nothing bad, but…I had to deal with much restlessness. I got stuck in a negative cycle. Because of my restlessness, I became more inward looking and selfish….which inevitably led me to become more restless! And as much as I sought peace in the Church…in the Lord… I slackened my efforts and didn’t try as hard keeping up with the extra little things that make my life Catholic. More restlessness. In the week leading up to camp, I was really busy with life at work and life at home. The Friday and Saturday prior to the start of Camp on Sunday, I was part of my college roommate’s wedding with the honor of being one of his groomsmen. I was so busy that life was nonstop all day Friday, Saturday, and Sunday prior to leaving to camp. I wasn’t mentally, emotionally, nor physically prepared to go to Camp Fort Worth because I didn’t have time. However, I was spiritually prepared because I squeezed in Daily Mass, Confession, and Adoration Saturday morning before my friend’s wedding. And then Sunday was pretty busy with Mass, errands, and packing. With all that said…back to my point…which is… yes, I was on vacation from work being at Camp Fort Worth. But more importantly, I realized at some point during camp that…I was on vacation, really, from my restlessness. Because of the mission-like nature of camp, it gave me opportunities to serve others. Really, to care and think about the needs of others before myself. I had to set my own anxieties and restlessness aside to better serve the people we reached out to with our various service projects…and to make those personal connections with other camp attendees, whether camper or adult. Not being worried about me was…refreshing! I’m glad that my first work site was the Boys and Girls Club, because…I had to worry about what 6-10 year olds cared about–not what I care about. That really opened the eyes of my heart to be more receptive to the needs of others for the rest of the week. Truly, a vacation of a different sort. I was restless until I rested in God, which is very Augustinian of me to say. But much needed. Knowing what camp means to me, I’m able to reflect further on Camp Fort Worth in that it allows me to feel more human within a community as a beautiful expression of Catholicism. The primary function of Camp Fort Worth is to serve others. Different work sites are set up by the core team to provide opportunities for campers to engage in acts of service in various ways. I think this lets us be more in touch with our humanity. I would wager that living a selfish life and pursuing all that makes me feel good on the outside hastens my departure from feeling truly human. We’re meant for greatness and to seek joy–the everlasting happiness or taste of eternal fulfillment. Working at the Boys and Girls Club and the nursing home really let me see two different ends of human life–being young and being old. The awesomeness of being a kid is possessing youthful innocence. The burdens of the world have not set in, yet. To see that in the kids at the Club inspired me to care less about all the crazy things that are happening in our nation and the world. Without worrying about all that, I could really focus on trying to bring a smile to these kids’ faces in playing games with them and getting to know them. I loved seeing their energy and enthusiasm and joy despite knowing that their home situations are typically less than ideal. Children are awesome. They’re people too. With the nursing home, I got to interact with people who have already experienced a lot. But, their worries and cares are different than kids…but…almost possessing the same simplicity. It was a little sadder because the nursing home can be sad and lonely for the residents who don’t get visitors that often, but I’m grateful for the opportunity to spend that time with the residents I visited with and together with the campers I went with that day, we brought smiles on their faces as well. I think of the elderly man that couldn’t speak back to me or didn’t seem to react to anything I said to him. I looked in his eyes for a while while he was staring off elsewhere, and I really sensed his human dignity even though it was a one-sided “conversation.” Elderly people are amazing. They’re people too. In today’s society, it’s really easy to reduce people to various identities. Do we really take the time to get to know people before we make a judgment call on who they are? I feel like we, as a society, do not. So, these experiences at the Club and nursing home allowed me to seek the humanity in these young and elderly individuals. And from that, in words that I’m not sure how to describe, I’m able to feel more human myself. Perhaps in bringing joy to others, I experienced joy myself, which is an inherent human sense of fulfillment. But none of this was done by myself. Lastly, this week of Camp Fort Worth was an awesome expression of Catholicism. Every day started with Daily Mass (even Morning Prayer, for those of us who woke up early enough!) so that we can hear the Word and receive Jesus in the Eucharist! Each day we reflected on a line or two from the prayer that Jesus taught us. Daily Mass and the Our Father really helped us focus on our mission to serve others during the week. Even the daily Night Prayer was tailored to the idea of service in modified readings instead of the ordinary readings from the Liturgy of the Hours. We prayed a Rosary one night. Confession was another night. I mean, our lives were very Catholic during camp, haha. I also thought about how our week of service provided us a chance to engage in corporal and spiritual works of mercy as we fed the hungry and gave drink to the thirsty (even if it was ourselves), sorted clothes so that the poor aren’t naked, visited the sick at the nursing home, counseling the doubtful and comforting the afflicted at the Club and nursing home, forgiving offenses willingly when something we didn’t like occurred, and of course…to pray for those we served. Awesome. As I grow more in my Catholic faith, it becomes more apparent to me that the nature of the Church and her faithful is to protect and respect the dignity of all human life, from conception to natural death. But not alone. We’re in communion with each other, but of utmost importance…we’re in communion with Jesus Christ who strengthens us in our mission here on earth. The more we pursue Jesus Christ and God our Father, the more we know ourselves better and be more in touch with our humanity as God created us to be. So, I praise God my life is Catholic. It gives the work we did at Camp Fort Worth a deeper, profound purpose whether we realize it or not. And the Catholic context in which we did our work further enriches our experiences. But alas, Camp Fort Worth is only a week long. Yes, I had fun, I made new friends, I learned more about myself, I helped others, I found Jesus in other places besides the temple (Joyful joke)…but camp is over. Jesus took his disciples up on a mountain in Galilee to go on a retreat with Him. But, they didn’t stay up there forever. No, the disciples had to come back down from the mountain and go back into the world. They took it home. Camp was a way to spend time with Jesus in various ways, but it’s over. Now, I have to take it home. 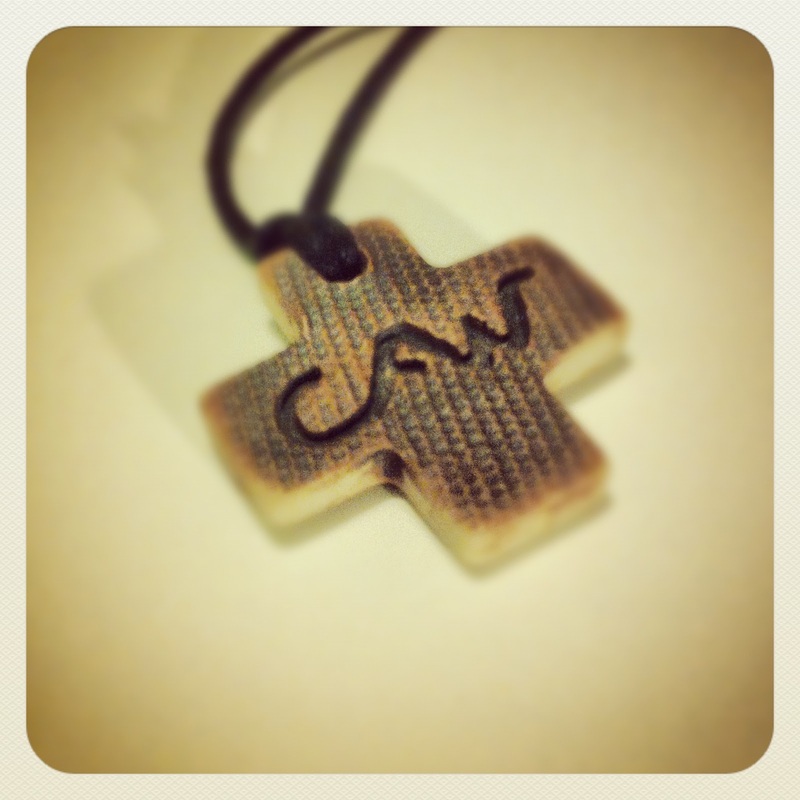 At the end of camp, we were given the CFW cross (pictured above). It’s a physical reminder that we have to take it home. I can…keep up with new friends I’ve made and make new friends with CFWers from past sessions, take a more active role in service work, and be more active in doing Catholic things like partaking in the sacraments. For me…to truly celebrate my experiences from Camp Fort Worth at home, I need to see how these experiences apply to my parish life. I slackened in my efforts praying the Rosary, Liturgy of the Hours, and going to Daily Mass prior to camp, but now I’m more motivated to make a sincere effort to commit to having an active prayer and spiritual life. Also, it might not look like it, but I’m a high school religious education catechist and even moreso, I help lead a post-Confirmation ministry. Youth ministry is awesome! I’m truly blessed to work with the youth at my parish. By experiencing Camp Fort Worth, I have some new ideas that I would like to implement such as visiting a nursing home on a regular basis, helping out at our Mission: Arlington equivalent, and other opportunities. But most of all, I was inspired by the A-Team. By their example, I want to model my post-Confirmation youth to be more like them. I hope to instill a sense of service to others while making personal connections for, really, all the youth in our high school program. Challenge accepted. Awesome. Being Catholic doesn’t end at the conclusion of a retreat/mission/service camp. take me with you to rio!!!!!!!!!!!!!!!!!!!!!!!!!!!!!!!!!!! May I just say your reflections are great!